The 16 members of Allina Health’s board of directors have remained mostly above the fray since a contentious round of negotiations with nearly 5,000 union nurses began in February. 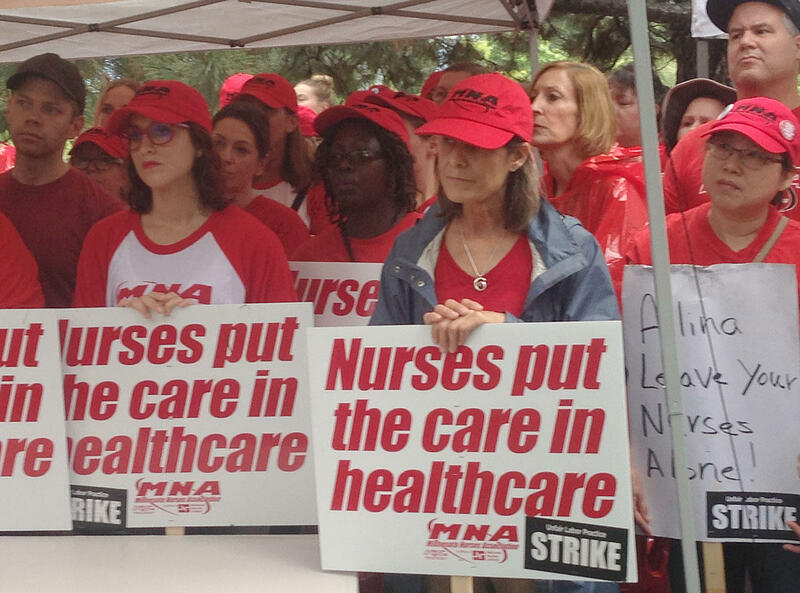 But that changed last week, when Allina nurses at five Twin Cities facilities began an open-ended strike and, at the same time, rolled out a campaign to hold their not-for-profit employer’s governing body accountable. 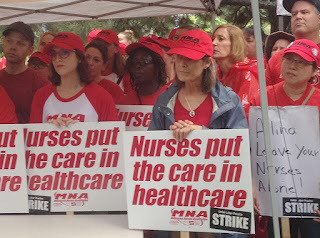 The Minnesota Nurses Association (link is external), which represents striking nurses, is publicly questioning whether Allina’s negotiating team, led by CEO Dr. Penny Wheeler, has provided board members with accurate information, particularly when it comes to the cost of prolonging the work stoppage after the two sides came so close to an agreement in their most recent talks. More Wall Street than wellness? It’s a question nurses have tried asking several board members over the last week, seeking them out in commercial high-rises and corporate headquarters – even on one college campus – across the Twin Cities. It’s a strange and troubling road map for tracking down the people who oversee a non-profit health care provider, and it reveals a governing body whose makeup skews more toward Wall Street than wellness. John Church chairs Allina’s board; he works a vice president at General Mills. Executives from Buffalo Wild Wings and the for-profit Capella University also hold seats. The financial sector is well represented too, with executives from four investment firms holding seats. There’s a lawyer, a retired partner in global auditing and tax giant KPMG, the founder of a Minneapolis consulting company and the president of Macalester College in St. Paul. Just four members of the Allina board (link is external) make their livings in health care. Two are doctors, one works in human resources for a local medical-technology firm and the other is an entrepreneur whose latest start-up helps employers shop for insurance providers. Equally disappointed are some members of the Macalester community with President Brian Rosenberg’s involvement in the nurses’ strike. That Rosenberg’s fingerprints are on the Allina standoff will come as no shock to anyone familiar with his approach to labor relations on campus. Two years ago, with Rosenberg at the helm, the school refused to stay neutral (link is external) as contingent faculty members attempted to organize a union. Rosenberg, meanwhile, was paid $10,000 for his service on Allina’s board in 2014, according to the non-profit’s most recent IRS filings. Paying board members is a rare practice in the not-for-profit health care world, according to an article published by Modern Healthcare (link is external) in June. But Allina paid out $190,959 to 15 board members in 2014 (link is external) for a job that, on average, requires two hours of work per week. Nurses and students plan to continue working together to hold Rosenberg accountable as the strike, now in its second week, continues. Alumni, too, “will want to make their voices heard on this issue,” according to Leewana Thomas, a member of the school’s 2014 graduating class. “If Brian Rosenberg continues to turn the other cheek on a major crisis happening right under his nose while preaching the merits of global citizenship, I know that the Macalester alumni will make their voices heard,” Thomas said. >> The article above is reprinted from the WorkdayMinnesota website and was written by Michael Moore.